We are offering a unique set of late Victorian Period Antique Blackburne Staunton Chessmen, nicely weighted with green baize base pads. These vintage chessmen are Boxwood and Ebony. The Boxwood chessmen have developed a warm, pleasing honey-hue. The King stands an impressive 4-1/2″ tall with a 2-0″ diameter base. All the chessmen still have their original green baize base pads. 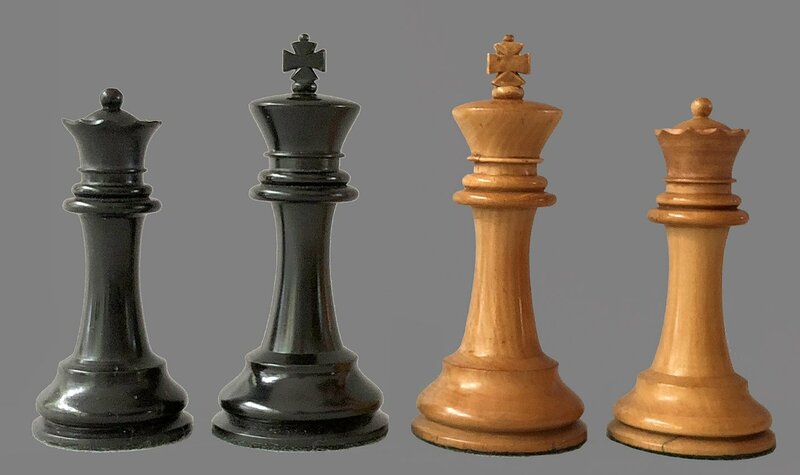 The Knights very closely resemble those found in some Jaques chessmen. 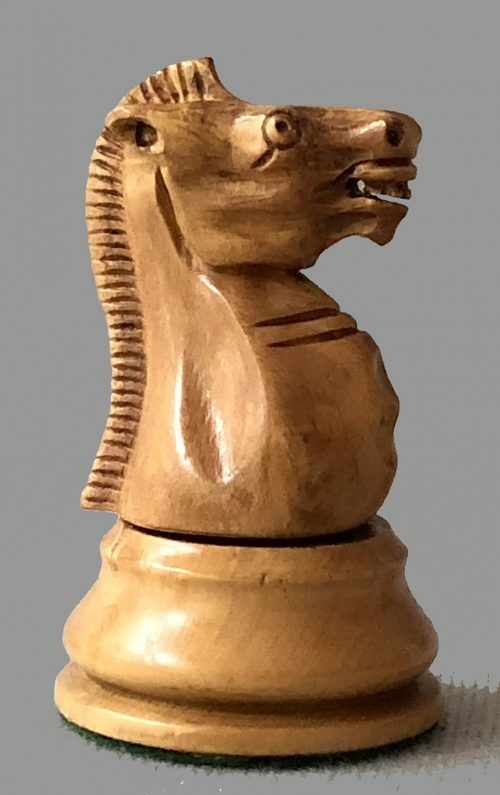 These chessmen were produced around 1890. The chessmen are housed in what is likely their original unlined Mahogany hinge-top box. 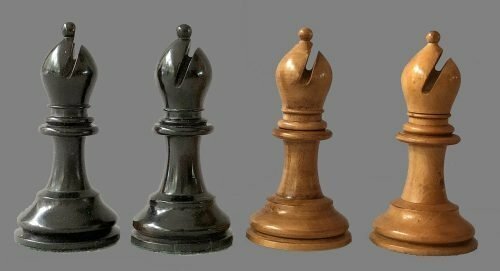 The chess pieces are in excellent condition. The chessmen play and display best on a chessboard with 2-1/2′ squares. 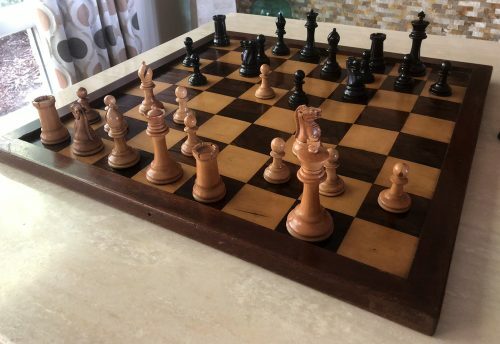 The antique chessboard shown is not included as part of this sale. Click here a complete selection of our finest new and antique chessboards. 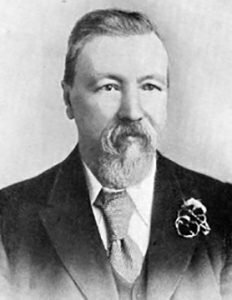 Joseph Henry Blackburne (10 December 1841 – 1 September 1924), nicknamed “The Black Death“, dominated British chess during the latter part of the 19th century. He learned the game at the relatively late age of 17 or 18, but he quickly became a strong player and went on to develop a professional chess career that spanned over 50 years. At one point he was the world’s second most successful player, with a string of tournament victories behind him, and popularised chess by giving simultaneous and blindfold displays around the country. Blackburne also published a collection of his own games. More information on Joseph Blackburne can be found by clicking here. The following account was published in Man of the Day. Number CCCCIIII, First published June 2, 1888. Buy APE, Carlo Pellegrini. “Joseph Henry Blackburne was born in Manchester rather more than five and 40 years ago. There was nothing phenomenal about his infancy, and he was well on in his young manhood when he first saw a chessboard. But he had been a precocious player at Draughts, and when Morphy, the blindfold chess player, went to Manchester in 1860, young Blackburn saw, wondered at, and envied him. Fourth with, he taught himself to learn the moves, and, in nine or 10 months from that time, he played with, and beat, one Pinder, the provincial champion, winning game after game from him – a good deal to his own surprise, and a good deal more to the surprise of Pinder. Not long after this he played 10 opponents blindfold, and won nearly all his games. He was then invited to play at the British Chess Congress in London in 1862, where he was pitted against the foremost players in Europe. Five years later, he became champion of Great Britain, checkmating 11 competitors from all parts of the Kingdom. Since then, he has held his own in every international tournament, at home and abroad; and 70 years ago he out Blackburned Blackburn by taking first prize in the Grand International Tourney at Berlin, defeating Zukertort, Mason, Paulsen, Winnower, Tschigorin, and nearly every other European player of the first rank.